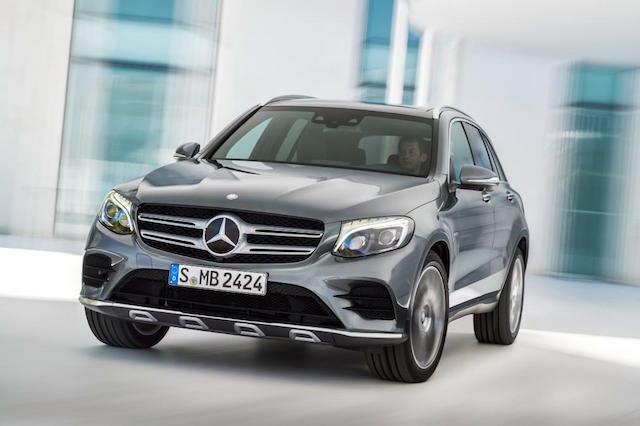 Right-hand-drive versions of the new Mercedes-Benz GLC will be more dynamic to drive than the left-hookers, says the luxury carmaker, only months out from the vehicle’s arrival in New Zealand. 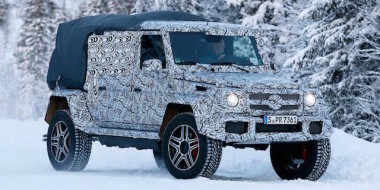 The mid-range SUV will land here around November, equipped with the company’s 4MATIC four-wheel-drive system but using a smaller front differential than GLCs built for left-hand-drive markets. Why? Re-packaging driveline components up front for the right-hand drive conversion forced engineers in Stuttgart to use the smaller diff. 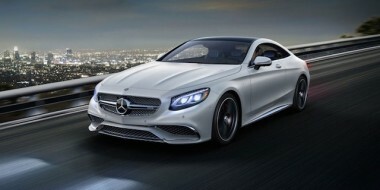 It works with the 4MATIC system to split drive 31 per cent to the front wheels, 69 per cent to the rear. The bigger diff in left-hand-drive models splits drive 45/55 for a more neutral front/rear bias. Therefore right-hand-drive models have more of a dynamic rear-drive bias, meaning they are “definitely more fun to drive,” says Uli Zillmann, GLC project leader. The gearbox in all variants is a nine-speed automatic. These are the first official pictures of the GLC, the SUV that Mercedes-Benz NZ has long wanted to challenge the BMW X3 and Audi Q5, among others. The GLC belongs to the C-Class family. 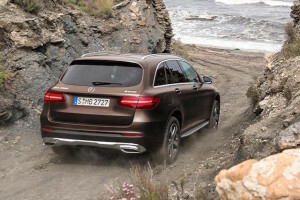 It shares the same underpinnings and familiar interior design and instrumentation as the C-Class sedan and wagon, but Mercedes-Benz says the SUV offers more space for occupants, particularly rear legroom. 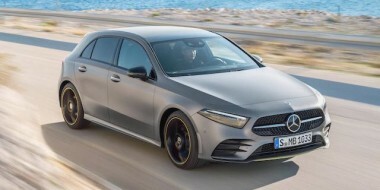 In the Mercedes-Benz pecking order, it sits between the GLA, the all-wheel-drive, hatchback-like crossover based on the A-Class, and the upcoming GLE, the replacement for what New Zealanders have known for years as the ML-Class. 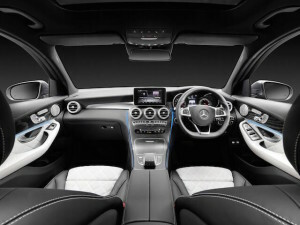 The GLE sits on the E-Class platform. Although it is bigger, the GLC follows the squat design of the GLA. At 4656mm long, 1890mm wide and 1639mm high, the GLC is shorter, wider and lower than the rival BMW X3 and Audi Q5. 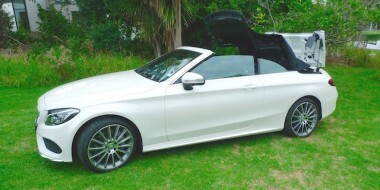 But boot space is pretty much the same, at 550 litres with the rear seats in place, or 1600 litres with the 40:20:40 split rear bench folded down. Also, the electric tailgate can be opened by waggling your foot under the rear bumper. Standard suspension is steel springs and adaptive dampers with air-suspension as an option. Select Sport on the five-mode Dynamic Select system and the air set-up drops the GLC ride height by 15mm. To help loading, the boot lip can be dropped by 40mm. 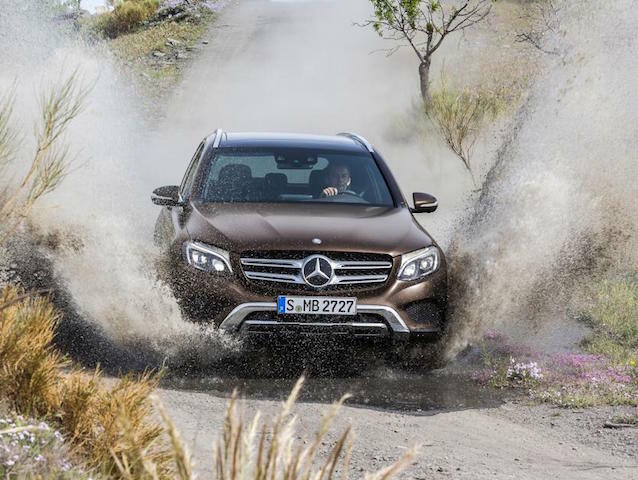 Also available is an optional off-road pack that can raise the GLC by 50mm for improved ground clearance. This pack also comes with five modes for improved going when things get sticky. Engine choices for NZ are not yet known, but the GLC launches overseas with two turbodiesels, the four-cylinder 125kW 220d and 150kW 250d, and the four-cylinder 155kW 250 petrol unit. The hybrid GLC 350e is also in the mix, combining the 250 petrol engine with an 85kW electric motor. May 13 | New Aston Martin coupe: will it be the DB10 or DB11?